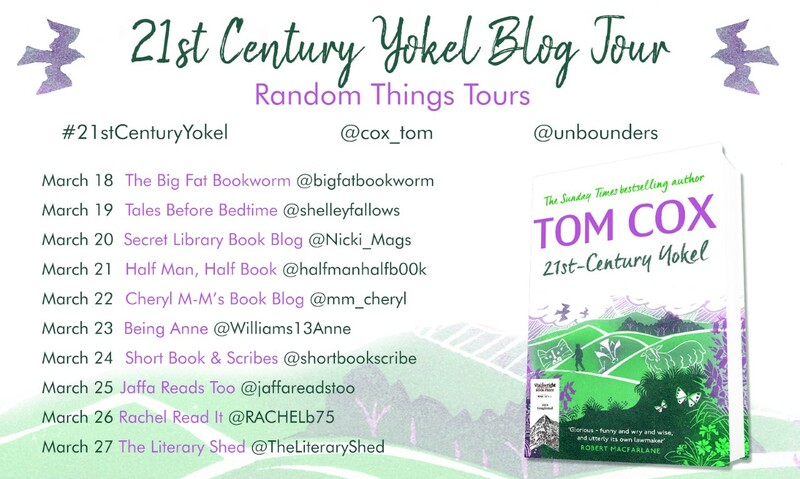 Welcome to Halfman, Halfbook for my stop on the Blog Tour for 21st Century Yokel by Ton Cox and published by Unbound. 21st-Century Yokel is not quite nature writing, not quite a family memoir, not quite a book about walking, not quite a collection of humorous essays, but a bit of all five. Thick with owls and badgers, oak trees and wood piles, scarecrows and ghosts, and Tom Cox’s loud and excitable dad, this book is full of the folklore of several counties – the ancient kind and the everyday variety – as well as wild places, mystical spots and curious objects. Emerging from this focus on the detail are themes that are broader and bigger and more important than ever. Tom’s writing treads a new path, one that has a lot in common with a rambling country walk; it’s bewitched by fresh air and big skies, intrepid in minor ways, haunted by weather and old stories and the spooky edges of the outdoors, restless and prone to a few detours, but it always reaches its destination in the end. Tom Cox has written ten books, including The Good, The Bad And The Furry, which was a Sunday Times top ten bestseller. This one, 21st Century Yokel, was described The Guardian as “a rich, strange, oddly glorious brew” and was longlisted for the Wainwright Nature Writing prize. 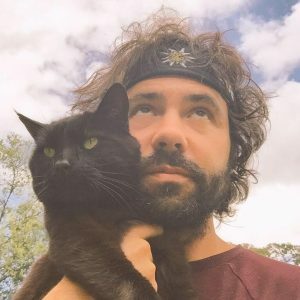 His newest, Help The Witch, is a collection of sort-of-ghost stories-which draw on folklore and the power of landscape. He often works in collaboration with his mother, Jo, who is an artist and printmaker and whose prints have featured in his books. When not writing, he is usually reading, mooching about in a secondhand record shop or bookshop or swimming or walking somewhere out in the elements in the South West Of The UK, where I have lived for most of the last five years. The facets that make up our character are drawn from many sources; our DNA, our family, our culture, our history and as Tom Cox argues in this book, the places where you grow up that can define you as much as these other things. The way that Cox recommends that immerse yourself in the local landscape is to walk through the lanes and paths, climb the hills and the stiles, take in the views and soak up the natural world at walking pace. The blurb on the cover says: It’s not quite a nature book, not quite a humour book, not quite a family memoir, not quite folklore, not quite social history, not quite a collection of essays, but a bit of all six. But there is a lot more in this book than that; crammed into the covers of the book. He is captivated by all sorts of things that he encounters on his strolls, from bees to beavers, scarecrows to owls and even his cats make an appearance a few times. Keeping his sanity by taking longs walks in the country around his Devon home gives him plenty of time to consider the world. All of the subjects he tackles begin with a narrow focus, before becoming wider ranging and for me, much more interesting. 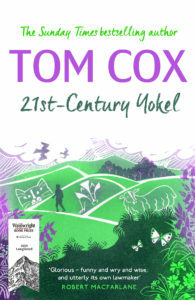 He is fascinated equally by the ghosts of the past as he concerned by the future of the countryside, but what makes 21st Century such a really good book is that it defies categorisation. Part of this reason behind this is because Cox writes about what he wants to without following any set agenda, and partly this is because this reflects modern life and all its distractions where you start on one project, get distracted by something else, wander off to get an item and arrive back four hours later wondering why you were starting that in the first place. Because of this, the book feels fresh and interesting, it has its poignant moments, the chapter on scarecrows is really quite creepy and is a great example of modern folklore, His VERY LOUD DAD makes me laugh every time he appears in the narrative too. This rich and varied book is not quite many things, but one thing it is, is fantastic. My thanks to Anne Cater at Random Things through my Letterbox for arranging this.